I start off this year with several goals, the biggest being completing my PhD. One of the main reasons for doing a PhD was to start an academic career, which I now realise, after several years of PhD-ing, is what James Burford recently referred to as Cruel Optimism (drawing on Lauren Berlant’s 2011 work). Briefly, cruel optimism describes the doctoral aspiration for the academic good life in spite the depressing reality of scarce academic positions and short-term contracts. Admittedly, I am an optimist, even in the face of the ‘precarious’ academic existence (see this article for example). Job stability is, after all, not a defining characteristic of many contemporary jobs and careers. A friend in an administrative role in New Zealand remarked to me that since graduating about five years ago, she has had five different positions in two different organisations. While she would have liked a more stable job, she has come to accept that positions come and go as companies restructure, chop and change. Her conclusion: Build and maintain your reputation. It was personal recommendations that enabled her to move from one position to the next. I have taken her advice to heart and my other goal this year is to build and maintain my reputation. But then I start asking myself, what exactly is my reputation about? To answer this question, I turned to recent ‘how-to’ books on being an academic: How to Be An Academic by Inger Mewburn from Australia (aka The Thesis Whisperer), and Optimising your academic career: Advice for early career scholars by Carol Mutch, a New Zealand-based academic. Their advice has affirmed what I’ve been doing to build my reputation as an emerging scholar. From Mewburn, I learnt about the academic ‘gift economy’ where giving gifts (e.g., sharing a journal article, donating time to a project) has unwritten rules about timing, expectations and reciprocity. So building a reputation could be about building social capital where the giver gets to be recognised as expert/generous/etc., and the receiver gains something valuable/solve a problem/etc. through various social relationships. But what if someone in the lower rungs of the academic hierarchy attempts to give gifts? What kinds of gifts would be appropriate and accepted? What kind of capital can be built through experiences and other relationships? Are the actions of gifting necessarily calculative? And do lower status givers eventually run into the cycle of cruel optimism? These are questions for one or several PhD topics, but my tentative response is that building relationships come first before getting involved in the gift economy. This was especially so as I had relocated from Singapore to New Zealand for PhD study, and did not have much of a Kiwi social circle to begin with. My experience with academic relationships, or social relationships for that matter, were initially disappointing. It seemed hard to connect with people or get the momentum going for more lasting relationships beyond the friendly his and byes. The faculty didn’t seem interested in engaging doctoral students in the wider academic community either, especially with restructuring and staff movement humming in the background. But over the years, having learnt lessons of patience and endurance, I’ve developed positive academic connections, some at the university, but mostly beyond my immediate physical location. As one academic shared with me, it’s unlikely that you meet a whole bunch of like-minded souls in the next room, or next corridor, or even the next building. Networks need to be built outside your immediate affiliations. I have done the usual route of conferencing, and depending on which conferences, some were more rewarding than others in terms of finding my ‘tribe’. But as Mewburn notes, social media is an underrated and underused resource for building social capital, reputation and relationships. I’ve been a techie of sorts since high school and I embraced social media several years before I started thinking about academia more seriously. While I do not expect any sort of close friendships through social media, various channels have enabled me to build an academic network with relations of varying closeness. Facebook helps me keep in touch with conference buddies, some of whom have become friends. Following various academic-related people and organisations on Twitter has led me to staying in touch with trends and the latest research. ResearchGate, the social media networking site for academics, has done exactly that for me – I follow academics of interest, and participate with everyone else in a mini gift economy: sharing and recommending articles with the wider network. While going social for academic purposes has its drawbacks such as potential time wasting, privacy issues, risk of having intellectual property ‘stolen’, I’ve come to embrace the benefits, mostly because I recognise my limitations. I came into academia relatively late in the game and I do not have an established professional network in New Zealand. Being an outsider and precarious on various levels, social media became for me a more level playing field. Even though there are clearly more established and experienced players in the academic social media space, it seems easier for me to navigate the rules and boundaries within a virtual space than the world of ‘real’. Some of my peers, however, see no immediate benefit in getting involved with multiple social platforms. I agree – the benefits are not immediate, and sometimes not even obvious. I’ve only seen the fruit of my social media ‘investment’ in the past year, after engaging with various academic others in the course of the PhD work of conferencing, publishing and the like. For example, through a conference call going around Facebook, I tested the social waters for interest in doing a symposium. After a few hits and misses along the way, our symposium made it to the 2017 New Zealand Association for Research in Education (NZARE) Annual Conference. Going social has also helped me shape my academic identity and find my niche, a topic that Mutch devotes a chapter to in her book, Optimising your academic career: Advice for early career scholars. In that chapter, she takes us through a series of questions such as: Why is it we want to do research? What is our passion? What makes us excited? What disciplines and areas does our research relate to? What do we want to be known for? Where do we want to go from here? It’s not an easy task to answer these questions by myself because sometimes the answer is: I don’t really know. But surveying research interests on social media leads to other topics, other strands of thoughts, and sometimes leads me to the answers to Mutch’s questions. So what can I conclude about my academic networks? Firstly, they are both real and virtual, one reinforcing the other. Sometimes the face-to-face relationships gets reinforced in the virtual, sometimes the virtual appears in the real. 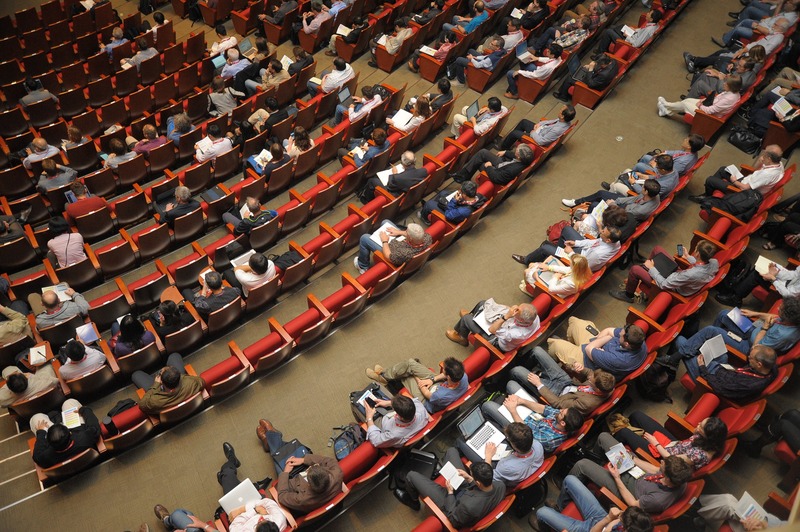 Sometimes the virtual will likely stay virtual, but who knows when a conference might change that. Secondly, my networks have grown alongside my PhD journey, again, one feeding the other. My PhD work not only results in the ongoing drafts I have to write, but also reflective blog posts, publications, and conference presentations. These more public endeavours lead me to virtual chats, meeting actual people, and expanding my sources for calls for papers and collaborative projects. Lastly, whether or not we call it social capital or gift economy, there is a sense that networks thrive because of everyone else believing that there is value in networks – the belief that you will find out about important information more readily, that you can throw up topics for quick discussion, and that you might find a gem or two (or a much needed recommendation) among these virtual conversations. And not to mention the sense of belonging to a wider community of scholars interested in the things you are. While the thought of a difficult and uncertain future after the PhD seems truly cruel, my experiences with social networks tell me that shares, likes and comments, plus longer and deeper conversations elsewhere, go a long way. So I choose hopeful optimism to start this year–and for the years to come. The year-end was a bumper crop of conferences, varied and productive but for different reasons. At the beginning of 2017, I had only planned on presenting at one conference, but along the way, other opportunities came along that were hard to turn down. Despite working up a hectic schedule of five presentations at four events over three weeks (and managing sore throats in between), it was an extremely rewarding period of connecting my work to a larger audience, establishing new connections, and reinforcing existing ties. 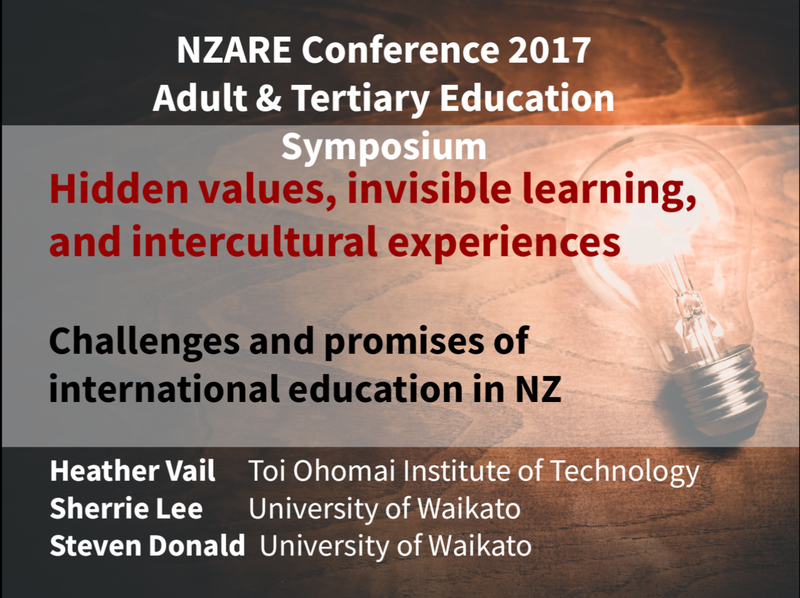 My first conference was the annual NZARE (New Zealand Association for Research in Education) held on home ground at the University of Waikato in Hamilton, New Zealand, from 20 to 22 November. This was my first NZARE conference and actually hesitated submitting an abstract because I had the impression that my field of international education was not of particular interest to an audience focused on domestic issues in New Zealand schools. However, being in contact with the ‘Students and Emerging Researchers’ caucus group representative led to several conversations on Facebook and I was able to gather some momentum for an idea to propose a symposium on international education in New Zealand. Subsequently, I rounded up two other postgraduate colleagues who had similar research areas, and called on my supervisor to be our chair for the symposium. Preparation for the symposium took some effort to coordinate, such as tying our different research topics together and doing our own internal peer review of abstracts and presentations, mostly through email or online meetings I’m glad to report that we worked well together and our symposium attracted a warm and cozy audience of about 15 or so people. Although international education has yet to catch on as a special interest group or an important theme within NZARE, I’m pleased that I’ve made a start in raising the profile of this particular aspect of education in Aotearoa New Zealand. I also presented another paper at the NZARE conference, not based on my research, but on my personal experiences as a PhD student in New Zealand, titled “The promise of diasporic academics: Potential partnerships between the local and global”. More about this presentation here, but would like to add that the presentation resonated with many in the audience, especially the postgraduate students. This then led to interactions with new postgraduate friends from other universities in New Zealand and Australia. Connecting with other emerging researchers in education was certainly one of the highlights of the NZARE conference, and I hope future iterations of the conference will consider having a larger focus on postgraduate students. The next couple of events took place at the University of Otago in Dunedin, an institution which I’ve long admired from afar. On 26 November, I attended the Education, Migration and Translation Research Symposium organised by the Centre for Global Migrations. The one-day multi-disciplinary symposium was varied in its presentations ranging from the classroom, to community, to larger ideological issues operating in diasporic and multiethnic spaces. Despite the wide-ranging topics, I enjoyed and learnt from the high quality presentations, not least the keynote presentation by Professor Michael Singh who demonstrated strong theoretical and historical links among the three big themes of education, migration and translation. This one day symposium was truly an unforgettable experience where we spent most of that Sunday in one seminar room, not only sampling a large array of research, but having rich conversations with one another. In contrast to the intimate setting of the symposium was the NZASIA Conference held from 27 to 29 November, also at the University of Otago. The disciplines represented at this conference stretched widely from studies on various Asian countries or cultures, in both the humanities and social sciences. The wide spectrum, however, meant that it was challenging to connect with others working in a similar field. In fact, only a handful of presenters were researching educational issues and were dispersed in various session across the conference. While the intellectual engagement was not as rich as I had experienced at the symposium, the pre-conference postgraduate workshops facilitated by representatives from Asia New Zealand Foundation were practical and immediately useful. In particular, the workshop on engaging with the media stood out for me as I learnt about how to interact with the media productively and how to maximize my social media presence. Something new I learnt was that Facebook is by far the most used social media platform in New Zealand, and that Facebook videos are becoming more mainstream in showcasing new ideas, policies and products. The final conference I participated in was the ISANA/ANZSSA Conference held in the Gold Coast from 6 to 8 December. This was the one conference that I had planned on attending just as the last ISANA conference ended last year. The International Education Association ISANA conference is the one conference that brings together practitioners and researchers in the field of international education in the Australasia region. Having participated and benefited from the 2016 conference, as well as being involved with ISANA in New Zealand, I was looking forward to the 2017 edition, this time co-hosted with its ally organisation, ANZSSA (Australian New Zealand Student Services Association), the peak professional organisation for staff in the post secondary sector in Australasia. The Gold Coast setting was probably popular with many, especially those who love the beach. Admittedly, I am not a Gold Coast fan and was missing previous conference venues such as Dunedin and Wellington. I did enjoy, however, staying at the Meriton Serviced Apartments which felt more like a 5-star hotel with its excellent amenities and service. Waking up to the 4:30 am sunrise meant I had several hours in the morning to do my rounds on social media and email, work on blog posts, and have a leisurely breakfast – all in the comfort of an air-conditioned living area. My paper presentation was scheduled during the Doctoral Consortium breakout session on the first day of the conference. While I was not expecting a huge turnout as there were several other practitioner-focused breakout sessions to choose from, there was an enthusiastic response from the audience who asked questions relating to both practical and theoretical aspects of my research. Apart from presenting my paper, I also managed to connect with various delegates from both Australia and New Zealand, and getting a sense of the nature and scale of international education business at different institutions. I also managed to meet other postgraduate students and academics with similar research interests. As brief as our encounters were, our conversations nonetheless sparked the possibility of future collaborations. My conference season ended on a high with my paper being awarded the IELTS Student Bursary Award for Best Paper during the conference dinner. What made this award extra special was that previous award winners were two female academics whose work I admired and whom I also looked up to as role models in academia. This was definitely a positive step towards my aspirations to be a researcher in international education! Best conference city: Dunedin, New Zealand. The lovely weather sustained throughout the five days I was there was simply unbeatable. Best accommodation: Meriton Service Apartments. The Nespresso machine won me over in an instant. Uninterrupted wifi came a close second. Best intellectual engagement: Education, Migration and Translation Research Symposium organised by the Centre for Global Migrations, University of Otago. 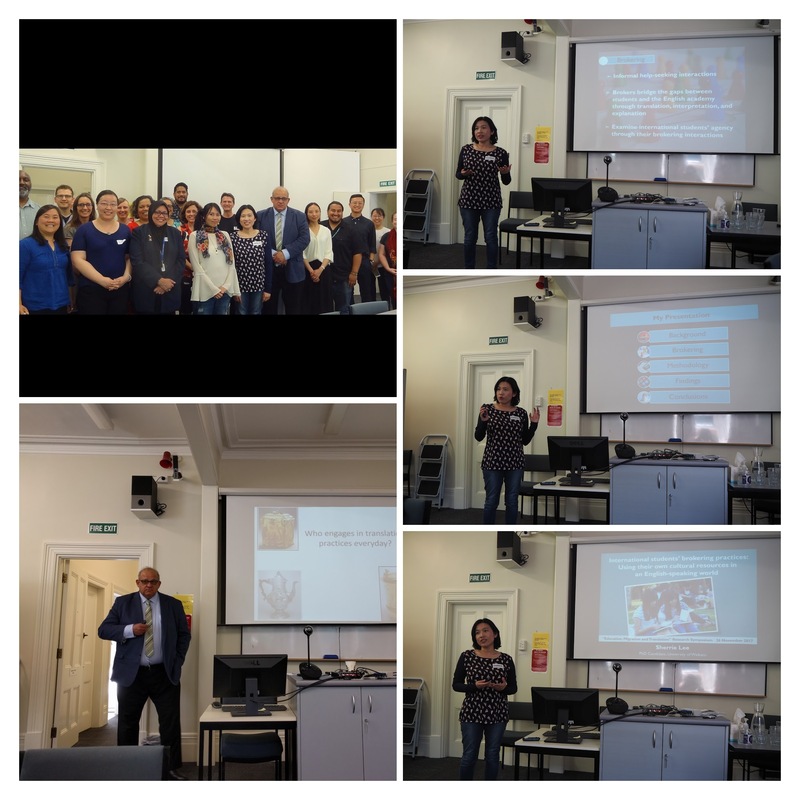 Best response to my presentation: NZARE Conference presentation – “The promise of diasporic academics: Potential partnerships between the local and global”. Most relevant for my PhD research: Doctoral Consortium , ISANA/ANZSSA Conference. Most conducive for postgraduate networking: NZASIA Conference. While I did not meet many in my field, there were plenty of opportunities to meet other postgraduate students during coffee and lunch breaks. Not sure what conference season will look like next year but here’s hoping for similar, if not better experiences! I’m coming towards the end of my data analysis involving Chinese/Mandarin data. It has been an exhausting process of working in two languages, whether at the technical level of translation or the analytical work of making sense of utterances in one tongue and articulating the analysis in English. I’ve taken different approaches toward translation for two different types of data. For the data sets involving mobile phone messages, I did the translation on my own and asked my primary participants to verify my interpretation. I felt confident of undertaking the translation on my own as the data was textual and was therefore faster to process the meaning from one language into another in the same textual medium. Furthermore, I was able to dictate the style of translation, aiming for a similar informal style of exchange in English. Also, because I had continued contact with my informants who had provided the data, I was able to consult them to verify my interpretation of the text messages. For the data set involving audio-recorded interactions, I asked a professional translator to do the transcription and translation. The reasons for not doing the translation on my own were related to my own limitations: i) The exchange was fast-paced and it would have taken me an inordinate amount of time to undertake the translation; ii) Translation was also difficult for me as I was not familiar with the style of speech of one of the participants. I wanted a full transcription of the audio data in order to do a comprehensive analysis, and I needed to have this textual form in a matter of weeks, not months, in order for my data analysis to progress and not stall. Thus engaging a professional and experienced translator outweighed the benefit of undertaking the translation on my own. The process of the two different approaches have been illuminating in understanding the nuances of translation from the broader perspectives of pragmatics and linguistics. I learnt a few lessons about translation. One, there may be several possible translations but one may fit the cultural context of the interactants more appropriately than others. Two, in using a Conversation Analytic approach to analysis, there is an inevitable tension between idiomatic and literal translations. In both text messages and face-to-face interactions, the character 恩 or the sound represented by the character 恩 was used throughout. In English, the sound of 恩 is equivalent to ‘uhm’ or ‘um’. If you heard ‘uhm’ in an exchange, it would be transcribed as such and be understood as a continuer in most cases. However, to transcribe it literally as ‘mhm’ would be to miss the point of the 恩 utterance in Mandarin. In text messages, it is more often than not, a response to acknowledge or agree with what was said in the previous turn. In verbal speech, it can be similarly used, or it may also occur as a continuer. Even in the use of as acknowledgement or agreement, there are choices when deciding on an English equivalent: ‘Yep’, ‘yeah’, ‘yes’, ‘ok’, and the like. When translating the text messages, I read the original exchange several times before deciding on whether 恩 was a nodding ‘yeah’ or a resounding ‘yep’ or an agreeable ‘ok’. In my participants’ review of my translation, there were times where they indicated a preference for a particular translation, e.g. ‘yeah’ instead of ‘ok’, which I incorporated into the final translation. With another similar sort of acknowledgement, 喔喔 (ō) (the character is used in duplication), my initial translation of ‘oh ok’ was replaced with my participant’s preference for ‘O I C’, a common shorthand for ‘oh I see’ in text messaging. How much translation do you need? Another lesson in translation came about when I dealt with the audio-recorded data that had been transcribed and translated by a professional translator. After I had received the transcription, I listened to samples of the recording to check against the transcription. My translator had done a stellar job. There were parts of the conversation that were difficult for me to ascertain such as particular words and phrases and what was said during overlaps. But the translator had meticulously captured the details and I was satisfied that it was a job that I could not have accomplished as well on my own. When I started to read through the transcription and the translation, I then noticed that the translator had taken a particular approach. She had chosen to provide an idiomatic translation at the sentence level, rather than at a phrasal level. This only became obvious to me as I had done the translation of the text message data set on a phrasal level to preserve as much of the sequence and structure of the original text. While it was relatively easy to do a phrasal translation for text messages, doing so for the verbal interaction was not so straight forward. There were many false starts and instances of careless speech which goes mostly unnoticed during actual conversation, but stand out most clearly in transcription. I could appreciate her choice of a coherent translation that conveyed the intended meaning of the speakers, rather than a slavish translation of odd sounding phrases. However, as I read and re-read, analysed and re-analysed my data, I found myself amending the translation to bear closer resemblance to the sequence and structure of the original language, as far as it was intelligible in English. This allowed me to note what the speaker was emphasising, as well as identity specific points where topic changes occurred. Another issue I had to grapple with was the level of detail I wished to show in my transcription. In the Conversation Analysis (CA) literature, Hepburn and Bolden (2013) recommend a three-line transcription comprising the original orthography in the first line, a morpheme-by-morpheme translation in the second, and an idiomatic translation in the third. I hesitated to incorporate this detailed level of transcription as I felt that the bulkiness of having a three-line transcription would detract the reader from ease of reading and understanding. Although I used a CA approach in analysis, my research was not solely centred around the CA methodology but rather CA was used as tool to support my analysis. Thus for the verbal data, I decided on a two-line transcription with the Chinese characters in the first line, and the English translation in the second. For the text messages, however, I wanted to re-create the appearance of the text messages as it was on the mobile phone which meant placing the original text in text boxes. The translation of the messages were then placed below the box, rather having it after each line of text. Never work alone in translating your data. Tap on your own linguistic and cultural resources but also recognise your limitations. Apart from making accurate translations, other equally important considerations are understanding context and speaker preferences, as well as the analytical goals of transcription. Hepburn, A., & Bolden, G. B. (2013). The conversation analytic approach to transcription. In J. Sidnell & T. Stivers (Eds. ), The handbook of conversation analysis (pp. 57–76). Oxford, England: Wiley-Blackwell. This post marks the start of a new blog – The Diasporic Academic. Starting a new blog allows me to choose a more appropriate title to reflect my current state of affairs. 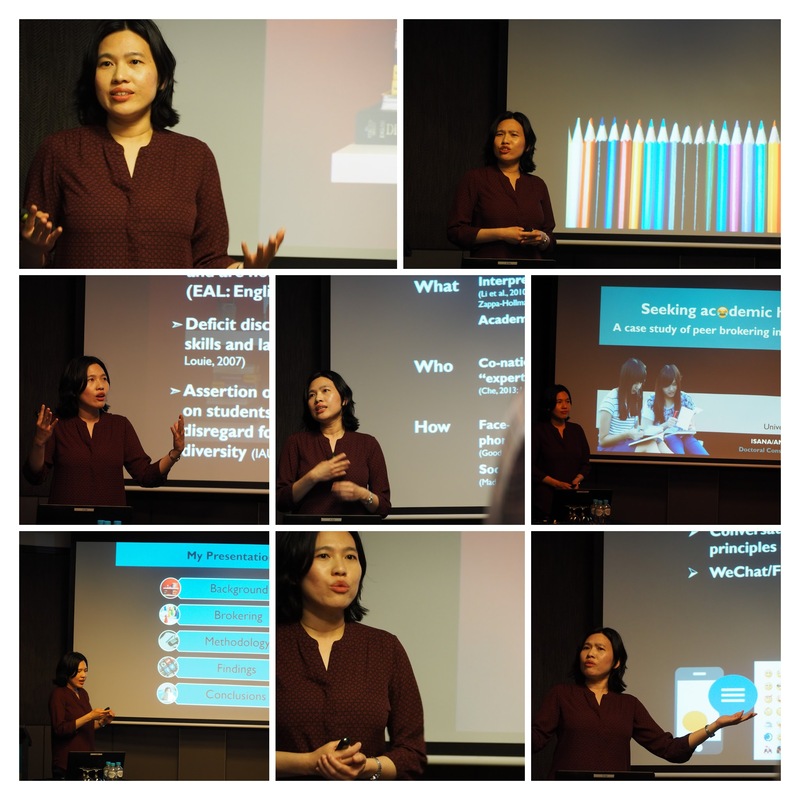 For the past two years, I was using Teacher Sherrie, a blog I started when I embarked on my MAT in TESOL, to write about my PhD experiences and research topics. I’ve been thinking about my academic narrative recently, and I realise that the ‘teacher’ label is simply not the right ‘frame’ for my current, and potentially, future endeavours. I first heard about the term ‘diasporic academic’ from Wendy Larner during her Keynote Presentation at the 2016 ISANA conference. The presentation was based on her 2015 paper, and according to Larner (2015), the diasporic academic is defined as one with multiple national affiliations. Examples include a researcher from one country based in another country working on a collaborative project, and a doctoral student from one country carrying out research in another country, or travelling between countries for research purposes. Apart from identifying academics as having links in more than one country, ‘diasporic’ further points to these individuals as being intermediaries, acting as transnational knowledge brokers. They broker international relationships between countries by using “their experiential understandings, linguistic skills and ability to read cultural nuance by providing insider accounts” (Larner, 2015, p. 202). I remember being inspired by this perspective of foreign/non-native researchers. I wrote down personal notes on what this term meant to me and I discussed this term with some fellow international doctoral students. We concluded that the concept of the diasporic academic was promising but also lamented that the current university climate viewed international doctoral students as funding and research targets more than transnational knowledge brokers. My initial enthusiasm was snuffed out quickly enough. Recently, however, the term ‘diasporic academic’ began to resonate with me again. In the past six months, I’ve been translating my data, analysing it through translanguaging efforts (Lewis, Jones, & Baker, 2012), that is, thinking in both English and Chinese to make sense of Chinese text and presenting the argument in English. 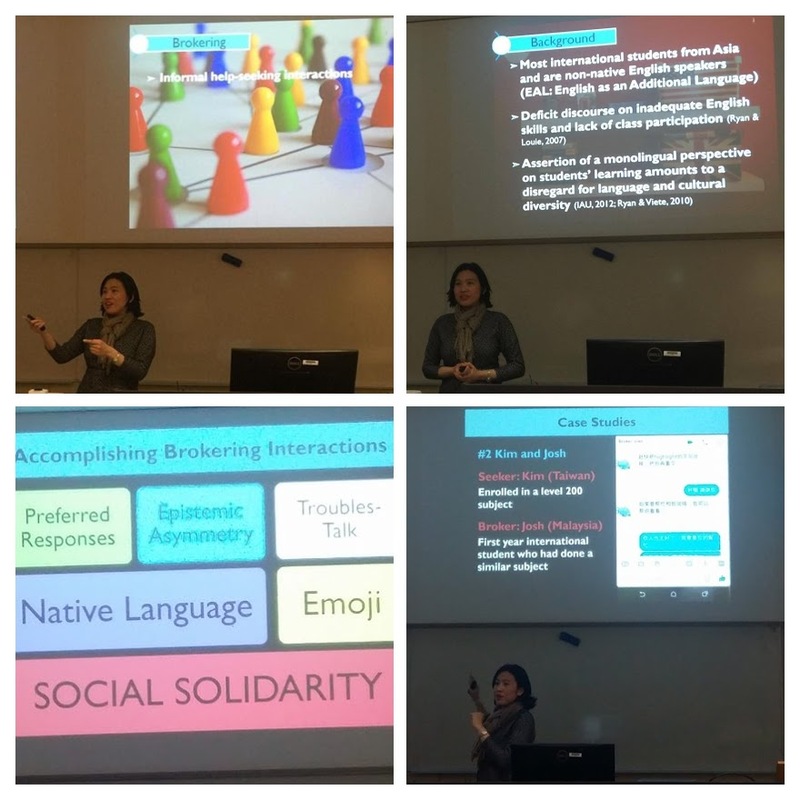 I also finished a draft article on being a bilingual researcher, and presented about conducting cross-cultural research in an English-dominant environment. And then as I sat down thinking about who I was as an academic, what kind of narrative I was trying to write, the answer presented itself: I am a diasporic academic. I am a diasporic academic, not only as a foreigner researching about international students in New Zealand, but also as a third generation Chinese Singaporean having to differentiate myself from other Chinese, both nationals and diaspora, to those unfamiliar with the ‘Chinese diaspora‘. I have to point out that ‘diaspora’ is a highly contested territory and many may disagree with how I have used the term. Nonetheless, I believe it is a term whose meaning is evolving with changing patterns of migration, whether temporary or permanent. And so the meaning I attach to being a diasporic academic will no doubt change in the course of developing an academic identity and career in the years to come.